Blockbuster, observing the popularity of services like RedBox (a DVD rental kiosk), has decided they’re going to skip a step and start offering movie rentals that come on an SD card. 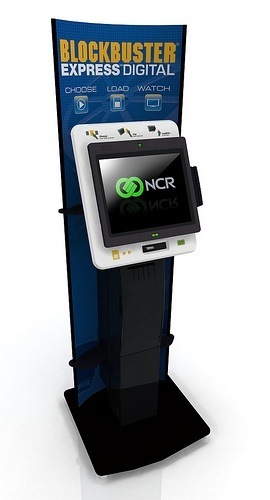 The new kiosks would load a DRMed movie onto your own SD card, and the content will expire after X viewings or days. They’re hoping that the better quality of the movies (vs. streaming ones or regular DVD) will bring users back. You might have picked a format that’s actually supported by media devices, guys. SD cards are everywhere, indeed, but there are precious few DVD players, TVs, and personal media players that support them. Your computer has an SD card reader, or else you’ve bought one by now, but I don’t think people want to rent things to play them on their computers if they can stream them so incredibly easily. Sure, working out how to get an SD card’s content onto your TV may be easy for tech-oriented people like you and me, but for the people grabbing a movie on the way out of the grocery store… not so much. With luck, Blockbuster will wise up and allow a USB drive to be plugged in. I mean, why didn’t they do that first thing? Everybody has those sitting around. And not that many people have high-capacity SD cards. If the movies are over 2GB, a lot of people are sunk because they only have the card that came with their camera (likely 512MB or thereabouts). Oh well, it’s a step in the right direction. Although I guarantee you’ll see a Blockbuster DRM-stripping app out there within a few weeks of these hitting the street.